Following the huge success of the 2012, 2013, and 2014 events, HomeGround and katebushnews.com are pleased to announce that there will be another Kate themed party this year. The party takes place on the night before the Summer Solstice, Friday 19th June 2015 and again will be at the legendary Royal Vauxhall Tavern. The RVT is in Vauxhall, South London, just over the Thames from the West End and is a two minute walk from Vauxhall Underground, main line and bus stations and is two tube stops from the Victoria railway terminus. The RVT is home to award-winning club night Duckie as well as the Hot August Fringe Festival and many other top music and cabaret events and performances. We start at 9pm and go through to 3am. The party will feature Kate-themed DJ sets from Paul Burston, Phil Marriott, Dave Cross and Paul Thomas. 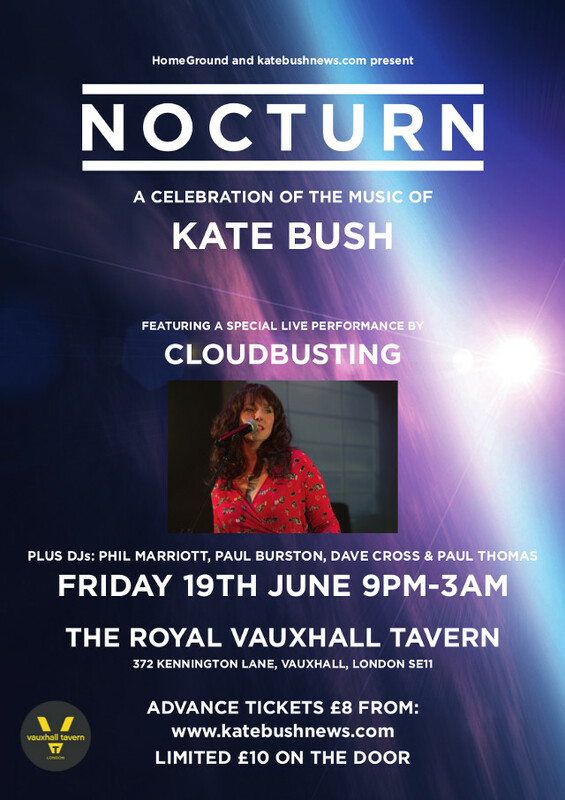 The night will also feature an exclusive live performance from Kate Bush tribute band Cloudbusting. The band will be performing a set mixing some of Kate’s most well-known songs with fan favourites. NOTE: There will be a limited number of tickets available on the door on the night for £10 each. 8 Responses to The 2015 HomeGround “Nocturn” party! London, Friday 19th June! Your ticket was sent in the email on 20th May. Check your spam. If you don’t have it, please confirm your email with us and I will send it again. Hello Ian – We got your ticket order on 28/5 and the ticket will be sent out in the email in the next few days. Are the tickets just in email form to be printed? Asking as i’m travelling down from Cumbria on Fri and they won’t reach me by post by then. Can I get tickets on the door?